I started drinking beer when I was around 7 or 8 when my dad would give us little cups of beer from his can. Nowadays I need more than just a little cup. Lately everywhere I go has had Summit EPA as the best beer on tap. Nothing wrong with a little Summit, don’t get me wrong, but I like a little variety in my hops. Surlyfest to the rescue. This beer is fantastic. I have to agree with Josh, its like an Octoberfest but with more hops, which is always a good idea (along with more garlic). So I met up with some other Brew52’ers tonight at Rock Bottom to try the ‘Catcher in the Rye’ ale that was being tapped with the help of Mike Redmond, Twins catcher. I didn’t really see Redmond anywhere, but I’ll take their word that he was there. The beer was great, it tasted a lot like an IPA but with that dry rye aftertaste, and you can’t beat the fact that it was free. To top it off, when the brewmaster announced the beer, he finished his little speech by downing an entire pint in one swill. Awesome. Erin mentioned that she thinks Grain Belt smells funny. From my experience, Grain Belt makes ME smell funny the next morning, I always have the worst gas the next day. Not unlike after a night that involves White Castle………..
We went to the Happy Gnome to try the Schell 1867 Munich Dunkel, which they said they had. I tried to order the beer off the menu but the server corrected me, saying that the Dunkel was coming next, after the current keg of whatever they had was gone. There was a few minutes of confusion and discussion and now I’m not sure if I had the beer or not. My beer was from Schell’s and it was dark in color. This is all I know. I’m gonna roll with that for now. 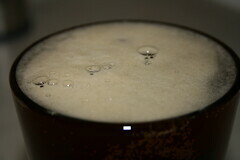 This was just a beer, nothing more, nothing less. I drank it over a week ago, but I honestly can’t even remember how I felt about it, which must mean that it was just so-so. I went to the meetup a couple weeks ago to try the Black Helicopter from Flat Earth. All I needed was one sip to determine that I will not be buying this beer ever 🙂 The coffee taste is simply too strong for my liking, I doubt I could even drink a pint of this, let alone enjoy it. The oatmeal stout from Lake Superior has a ‘thick’ taste I think. Its pretty good, I would compare it to a brown ale almost, a dark brown ale. 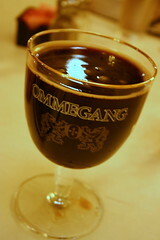 What I liked better about this beer than other brown ales was that it had more carbonation. I don’t really care for beers like Newcastle because they taste a little flat. Summit’s Maibock was like Schell’s Maifest for me – I didn’t realize how good these beers were a couple years ago. I was pleasantly suprised at the full flavor that this beer had, I even ordered it on tap a couple times after trying it for brew52. I have fallen behind in my reviews, I’m going to start catching up right now. I liked Schell’s Pilsner more than I thought I would. I view pilsners as just bland, lighter beers, but this one actually had a pretty good taste to it. A good beer if you want to want to drink several, but can’t bring yourself to drink Miller Lite. This beer is nasty, I can see why they don’t mention it on their web site, I wouldn’t want to draw attention to it either. Before I picked up the Schell’s Maifest I hadn’t tried a maifest beer in a couple years because I thought the last time I tried one I didn’t really like it. My tastes must have changed since then because I think this beer is great. I’m not a fan of wheat beers, which is what I thought maifest would be, but it says on the bottle that its a ‘full bodied blond double bock’ which sounds like how it tastes. Finnegans is an OK beer, nothing more nothing less. 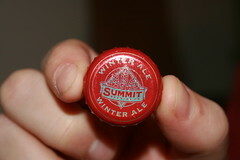 Its interesting that they have summit brew it, and they use summit bottles. Its also cool that they give away their profits to charity. I wish they sold winter warlock in 6-pack’s of these bombers, it’d be badass to walk out of a liquor store with 6 huge bottles of a good, strong beer like this. I grabbed the last bottle at Big Top, which wasn’t a big deal, since I knew Erin wasn’t going to have much. I thought this beer was great, but I would probably only be able to have two a night. I really enjoyed the boozy wine-flavor mixed with the hops, it was great. With the heat wave today Erin and I decided to enjoy our beers on the porch (with the space heater). The Lake Superior Special Ale is a wonderfully drinkable beer. Its a pale ale, I think, but with just enough hops to give a little bitter flavor, but you can totally drink several of these a night. I read the label on the Frame Straightener and saw that it was a Belgian with some plum flavors and I was ready to take a sip and pour the rest down the drain. I was pleasantly surprised by the mild flavor, this is actually a very drinkable beer. Most of my experiences with Belgians has not been good, but this is definitely one that I would consider buying, if for no other reason than to have it around when I wanted a change of pace. And I have to agree with lowrez, the Brau sister is a hottie. Does it get any better than German AND hoppy all at the same time??!? 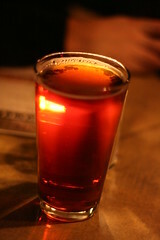 I liked the Alt the best of the 4 beers I tried at the Herkimer and I will definitely get it again the next time I go. I feel bad. Last winter I was all about the winter ales, I loved the Sam Adams Winter, Summit Winter, and Red Hook Winter Hook. This year, though, I don’t like them at all, its as if I’ve regressed as a beer drinker. Most winter beers that I drink now have too much spice and raisin taste to them, and this weeks Summit is just that. Too much raisin and spice and not enough bitter hop taste. I should probably be rating this beer based on the fact that its trying to taste like a winter ale, and not Surly’s Furious. In that regard, I do give this beer high marks. The taste is not overpowering and the aroma is subtle enough to make me keep smelling (ask Erin if you don’t believe me). That, and I just have nothing but love for Summit (how can you not??). I love Surly’s Furious. I’m not afraid to say it either, I love it. Being a fan of really hoppy beers and also being completely willing to jump on the bandwagon that is Surly, this is the beer for me. I actually liked the Bender more than the Furious the first time I tried them both, but have since come around to appreciate the Furious more. The delicious smell of the Furious is only topped by the Hopslam that I had recently (which I definitely encourage people to try). My first 5 star rating, but certainly not the last, at least for Surly. I look forward to trying the other beers from flat earth later this year, I think I may enjoy them more. How can you not like a beer that smells like college, no matter what school you went to. This beer smells in particular like when I would visit my friends in Grand Forks, ND. Thats the smell of cheap beer, beer that tasted strong when you first started drinking, but now tastes like water since you’ve become a total alcoholic. I had no pretense for Glueks Honey Bock and it didn’t disappoint. While the smell reminds me of college, the taste is like aged Miller Lite. Theres not a chance in hell that I would buy this beer over any other better cheap beers, but it was a fun one to review and reminisce. I didn’t like this beer. I’m not a big fan of the fruity taste and after reading the label, I could taste the raisins they mentioned. I’m always biased towards hoppy pale ales so maybe I’m a bad reviewer for this beer, but I won’t be picking up a 6 pack of the Snowstorm this season, maybe I’ll have better luck next year.